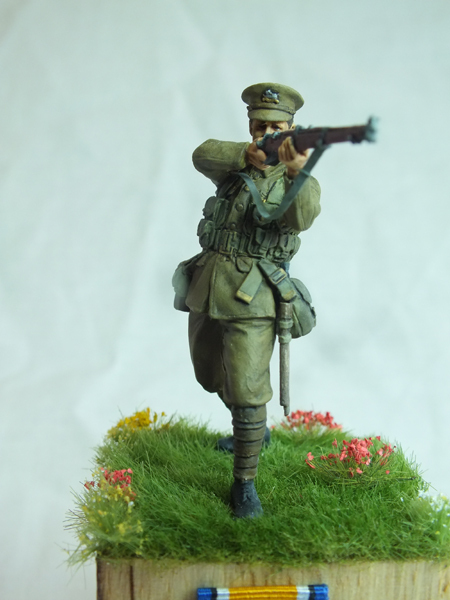 The second figure in the Tommy’s War range is also modelled on events at Mons on August 23rd 1914. The 1st Battalion the Lincolnshire Regiment had been stationed near Portsmouth prior to declaration of war and had mobilized to France with the rest of the BEF and formed part of II Corps. The Lincolns formed part of the reserve on the first day of the battle of Mons and manned the barricades through which the forward regiments (4th Royal Fusiliers and 1st Northumberland) retired through, holding a rearguard, fighting street by street, as the British army retreated from Mons back towards the reserve positions. The figure is cast in fighting order as the soldier would have appeared around the town of Mons, he is modelled with the cap badge of the Lincolns, but the cap badge could be removed and replaced with a modelled badge to represent another British regiment right up to early 1915 which was the point when the Brodie helmet was introduced.